in the bright summer sun. But it could not be. What has been once can never come over again. And people can be little babies, even water-babies, only once in their lives. Besides, people who make up their minds to go and see the world, as Tom did, must needs find it a weary journey. Lucky for them if they do not lose heart and stop half-way, instead of going on bravely to the end as Tom did. For then they will remain neither boys nor men, neither fish, flesh, nor good red-herring: having learnt a great deal too much, and yet not enough; and sown their wild oats, without having the advantage of reaping them. 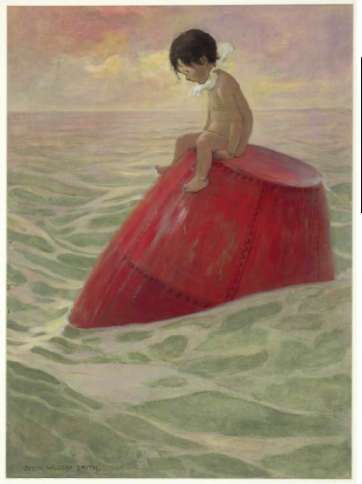 But Tom was always a brave, determined, little English bull-dog, who never knew when he was beaten; and on and on he held, till he saw a long way off the red buoy through the fog. And then he found to his surprise, the stream turned round, and running up inland. It was the tide, of course: but Tom knew nothing of the tide. He only knew that in a minute more the water, which had been fresh, turned salt all round him. And then there came a change over him. He felt as strong, and light, and fresh, as if his veins had run champagne; and gave, he did not know why, three skips out of the water, a yard high, and head over heels, just as the salmon do when they first touch the noble rich salt water, which, as some wise men tell us, is the mother of all living things. “Oh, then,” said Tom, “I shall have playfellows at last,” and he swam on to the buoy, and got upon it (for he was quite out of breath) and sat there, and looked round for water-babies: but there were none to be seen.